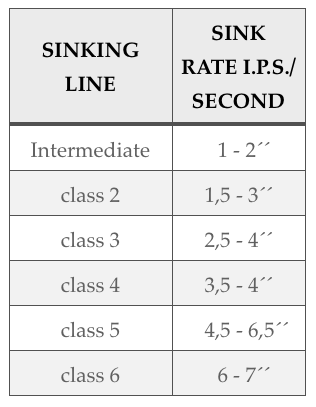 Sinking lines have different sinking rates. Some sink slow, some sink like an anchor depending on their respective densities. Fish holding at the bottom of deep pools can be reached with a sinking line. In heavy flow, you also need a sinking line to get the fly down where the fish are holding. 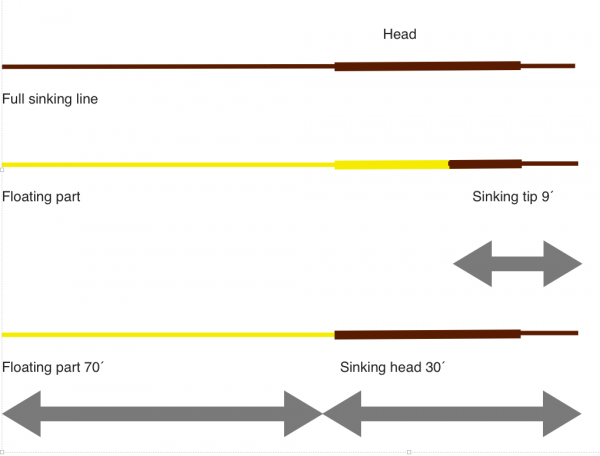 If you fish with a sinking line your leader should be much shorter (see leaders). Fly lines need to be on or just under the surface for us to be able to cast them. When we use a sinking line, we need to roll cast it to get it to the surface (dig it up), and once there we use a so-called roll cast pickup, and immediately into the back cast, and out she goes. Sinking lines are conventionally in dark colors. Full sinking lines are the thinnest lines in each # class (they are the densest). They are ok to cast but a bit of a chore to dig up to the surface for recasting. Curiously, shops like to sell beginners so-called sinking tip lines. Sinking tip lines have the first 9′ sinking, while the rest is of it floats. I do not advocate them for beginners at all. Beginners (and even decent casters) will have problems casting them. The sinking part has more density than the floating part. Therefore, it hinges where they meet. I do not like or use a sinking tip line ever. Sinking head lines will have the whole head sinking but the running line floats. They are easier to cast than sinking tip lines, and we keep the sinking part in the tiptop to avoid the hinging and shoot line for distance. Schematic presentation of sinking line varieties. Therefor density compensated sinking lines were developed. That means the line has varying density (and sink rate) along its length. For instance, the running line is intermediate for 45′ – then there is a section of sink 3 for 20′ – and finally the head is sink 5 for 25′. This line will be straighter in the water column. There are different sink combinations to match the various scenarios we fish in. These lines will cast very differently than a floating line. Do not false cast much and open up your loops.